The first step in switching from conventional to natural organic lawn care is to assess the quality of the existing lawn. If an existing lawn contains few weeds and consists of a desirable turfgrass species, natural organic methods and cultural practices can maintain a satisfactory lawn. If however, excessive weeds or an undesirable turfgrass species dominate the lawn, it may be best to kill the entire lawn and start over, add plenty of organic matter to the existing top soil and then seed with a quality lawn seed. The next step is assessing soil quality. Natural organic lawn care methods underscore good soil quality as a prime factor in growing healthy lawns. Good soil contains plenty of organic matter. 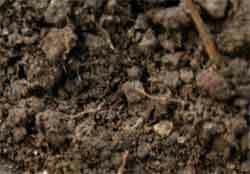 Organic matter improves soil structure by binding mineral soil particles together to form aggregates. Aggregates create greater pore space among the aggregated particles, providing optimal conditions for root growth. Increased pore space also improves both soil drainage and water-holding capacity and improves soil aeration. Sufficient quantities of organic matter in the soil also aid in nitrogen fixation, reduce soil borne plant diseases, and helps hold on to nutrients for plant use as needed. Good soil also contains adequate nutrients plants can readily use. A useful tool in the assessment of soil quality is a soil test performed at a soil-testing lab. Most tests will measure pH and various nutrient levels. Also included will be recommendations for chemical fertilizer applications to correct apparent deficiencies. Organic matter tests are usually available as an option and measure the percentage of organic matter in the soil. The transition to natural organic methods can be instituted at any time if you're saving the existing lawn. Choose appropriate organic fertilizers with the right ingredients to correct deficiencies found in the soil test. Most soil test recommendations are based on using conventional chemical fertilizers. Use the nutrient rates recommended in the soil test as a guideline for the application of natural organic fertilizers. If you're not saving the existing lawn, follow directions suitable for re-establishing a lawn in your area. Cultural practices in natural organic lawncare are similar to those used in conventional lawn care. Proper maintenance techniques and timing are more crucial in a natural organic lawn since the aim is preventing potential problems. There are two key points to keep in mind when going organic. The first is that compared to conventional lawn care, results take longer. Organic lawn care stresses ongoing soil building and understanding that there are no quick fixes as promised by conventional chemical fertilizers. A few weeds or insects here and there are part of the organic approach. Perfection should not be an expectation. Used consistently, a reasonably uniform green lawn, resistant to adverse environmental conditions can be expected and all without relying on artificial chemicals.